In mid June Elizabeth Park in Hartford, Connecticut, the oldest municipal rose garden in the country, begun in 1904, celebrated its rose weekend. Though by then some of the roses had gone, the garden impressed me as an example of community gardening. Volunteers tend the rose garden, and several others in the Park, like the annual and perennial beds. They do an outstanding job, if you could measure their success by the crowd there that hot sunny afternoon. All kinds of “Ooos” and “Ahhhhs”, which would make any gardener happy to hear. 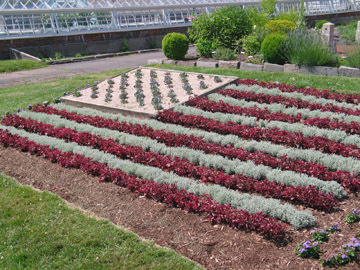 Near the greenhouse I saw this example of carpet bedding in the shape of an American flag. Among the short plant varieties is, I think, Portulaca. They need to be kept trimmed to keep the effect. Carpet bedding was a popular form for flower gardens in nineteenth century England. We adopted the practice here as well. Today Elizabeth Park continues that tradition of the English garden. The English tradition of carpet bedding lives on in Hartford in this flag.